The most iconic of the three paintings of the Langlois Bridge made by Vincent Van Gogh. This bridge became one of Van Gogh’s favourite spots to utilise his Japanese influences. 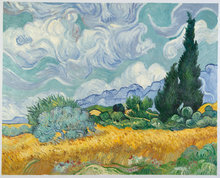 Vincent Van Gogh was renowned for his seamlessly incorporate multiple styles of painting into his work. During his stay in Paris, Van Gogh had painted several pieces which were heavily influenced by Impressionism and Japanese prints. Our artists accurately recreate the works of Holland’s most iconic painter by closely studying Van Gogh’s painting techniques, brush strokes, and colour palettes. We can create a hand-painted replica for your personal collection very close to the look and feel of the original Van Gogh. Back in France, Van Gogh had created a replica of Japanese painter’s Hiroshige’s block print of a bridge (Bridge In The Rain) in order to understand Japanese colour schemes. 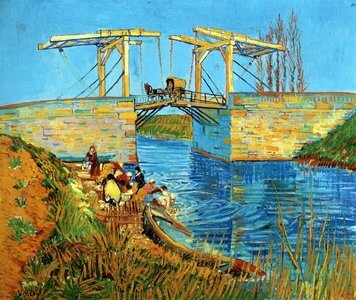 When he saw the Langlois bridge, Van Gogh decided to test his understanding of the same. 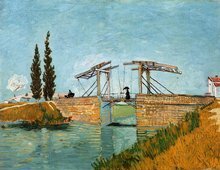 Van Gogh was able to effectively bring in his Japanese and Impressionist influences together in this painting of the Langlois bridge. This was primarily achieved by his way of painting with an impasto.